And so, the Daddy’s Home saga continues. Brad Whitaker (Will Ferrell), the sensitive daddy, is now best buds with his wife’s ex-husband, Dusty Mayron (Mark Wahlberg), the cool daddy, and all is almost right in the decked halls of the perfect American McMansion. But as prophesied in the sequel’s ominous tagline (“More daddies. More problems.”), it is now time for the grandpas, the daddies’ daddies, to swoop in and spoil the balance of Dusty and Brad’s joint daddyship. Enter Don (John Lithgow), unmanly pops of Brad and beloved step-grandpa to Dusty’s two children, and Dusty’s own absent, demiurgic old man, Kurt (Mel Gibson, continuing his late-career apology tour), a gruff, womanizing ex-astronaut who throws the Whitaker and Mayron households’ Christmas plans into disarray by inviting them to spend the holidays together at a rented ski lodge. Cue the Griswold-ian mishaps: a cell tower chopped down after being mistaken for a Christmas pine, elaborate decorations being torn apart as a string of lights is sucked in a snowblower. Will the daddies eat each other in a display of dominance? Or will they open about their feelings and join in the universal bonds of daddyhood? The vacation-emasculation premise might smack of the nasty laziness of late-period Adam Sandler, but returning director and co-writer Sean Anders (Horrible Bosses 2, the Sandler vehicle That’s My Boy) brings a soft touch to Daddy’s Home 2. It probably helps that, unlike the original, in which Ferrell’s Brad flailed and humiliated himself in an attempt to impress his wife, Sara (Linda Cardellini), and step-kids, the sequel snuggles itself deep into the comfort zone of today’s middling studio comedies: male friendship. There’s a book waiting to be written about the way modern Hollywood comedies squirm around their portrayals of romance; both Sara and Dusty’s secretive, shoplifting-addicted second wife, Karen (Alessandra Ambrosio), are thanklessly underwritten characters. Instead, movies like Daddy’s Home 2 opt for stories about friendship and one-upmanship, a stuck-in-high-school mindset revealed by the sheer number of school-assembly and talent-show embarrassment subplots in these things. 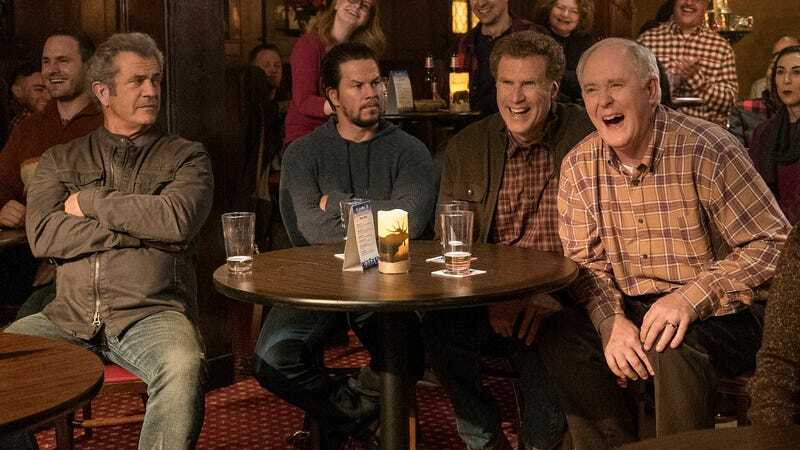 Daddy’s Home 2 has one, too, involving a performance of the risible “Do They Know It’s Christmas?” In fact, the movie has so many rote, half-baked subplots that they end up obscuring its ostensible center: Dusty and Brad’s truly sweet friendship, threatened from outside by Karen’s ex, Roger (John Cena), the biggest and toughest daddy of them all, and by Kurt, who acts as the smirking, overbearing devil on his son’s shoulder. (The movie even pokes fun of its attention-deficient plotting, as the characters realize that they’ve forgotten a family member in a preceding scene, returning to find him frozen in the snow, surrounded by wolves.) There are good gags here: the Whitakers and Mayrons getting stuck in a snowed-in, sold-out movie theater where the closest thing to an available family-friendly option is a Liam Neeson revenge thriller (“No, kids, we did it… We killed them together”); an audience-participation improv game that devolves into a confrontation between father and son while the unwitting spectators keep laughing at every word. But like the passable original, this formulaic comedy can’t stop teasing the possibility of a funnier, smarter movie being made with the exact premise, central conflicts, and stars.